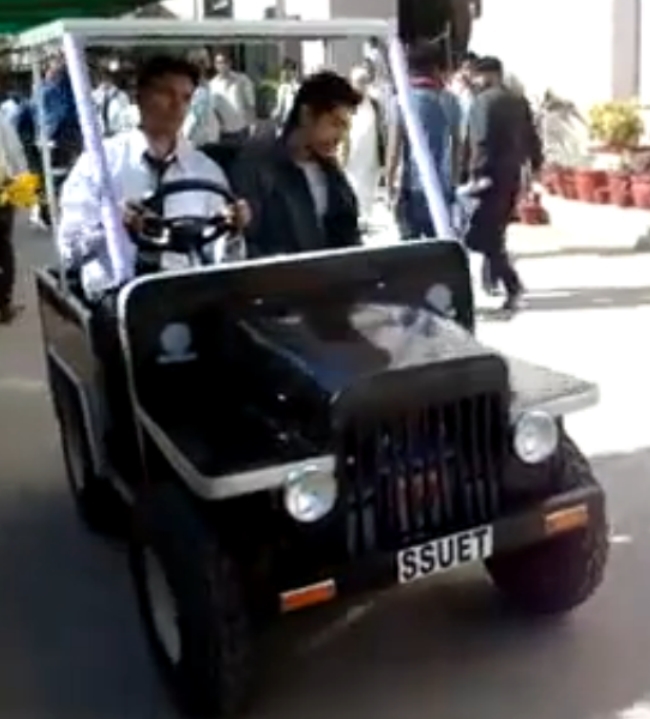 Group of Students from Sir Syed University of Engineering and Technology, Karachi, Pakistan, Invented an amazing car which consumes Solar Energy as its fuel; yes it’s a Solar Car, Pakistan’s First Ever Solar Car. This is the Same Institute whose students presented the idea of Pakistan Energy Ramp (previously discussed it). Farhan and Shafiq are the two geniuses behind this idea. Farhan and Shafiq are students of Electronics from the Sir Syed University of Engineering and Technology, Karachi. This car was their Final Year Project. This Solar Car was presented in All Pakistan Senior Design Project Competition PAF KIET SEE 2011 designated with the 2nd prize. 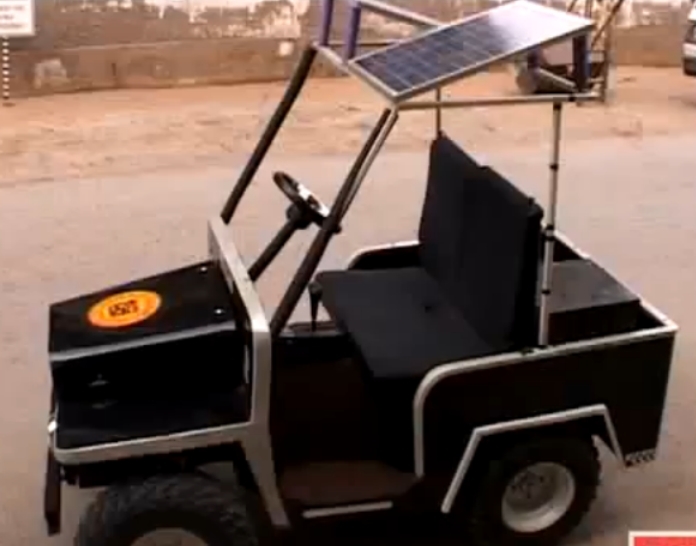 Regardless of Solar Energy this car can be charged directly with the Electricity. There are lots of amazing features in this car. First of all, it is PASSWORD PROTECTED. One has to give correct password to start the car. Gear box is manual as of other cars. A DC motor is used in place of engine. All meters in the car is Digital including RPM, Speedometer, Gear Indicator and Batter Status Indicator. Two 40 watts solar panels are used, in total 80 watts, which generates 24 volt electricity provided to the battery bank. “Solar panels are too expensive so we can not afford more panels, if more panels are used then more electricity will b generated and ultimately performance of car will be better”, said by Farhan. These students spend Rs. 168,000 on this project. Average speed of the car is 40-45 km/h. This car gives the mileage of 60 Km per Charging means if battery if full one can travel 60 kilometers with this charging. “If we calculate per kilometers cost, it is Rs 0.5/km only”, Said by Shafiq. As we mentioned above this can b enhanced by using more Solar Panels. Disc Breaks are used as the breaking system of the car. A combination of Circuits and two batteries are inside the hood, Details of these Circuits are explained by Shafiq in the Video Below. For some Teams it’s a Car, for some Teams it’s a Project, for us it’s an Ideology; An Ideology to prove that Pakistan can be Constructive. m feeling Honor to b a Pakistani. I want to contact the Engineers to discuss possibility of funding the project for developing a production level prototype. I've learn a few good stuff here. Definitely worth bookmarking for revisiting. I surprise how much attempt you place to create the sort of fantastic informative website. I am really pleased to read this web site posts which contains tons of helpful facts, thanks for providing these data. Hi to every one, it's actually a nice for me to visit this web page, it includes precious Information. I'd like to keep up with anything fresh you have to post. Could you list the complete urls of your community pages like your twitter feed, Facebook page or linkedin profile? Geo Pakistan Students. Its a great inspiration in Pakistan.Because we need Solar Energy in Pakistan and InshaAllah you will give Success, GOD Blessed You. Great approach toward implementing solar energy in Pakistan. Keep it up!! This is the most ridiculous invention as it disrupts what solar energy is all about.